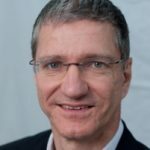 In his function as the coordinator of the partner project NeurOmics, Olaf Riess is a member of the Scientific Advisory Board of RD-Connect. Professor Olaf Riess is the head of the Institute of Medical Genetics and Applied Genomics at the University of Tübingen and has more than 20 years of experience in genetic disorders. His group focuses on neurodegenerative diseases, from the clinical as well as the basic research perspective. In his research, he is particularly interested in Parkinson's, dystonia and spinocerebellar ataxias. He has coordinated numerous international, European and national funded consortia and is currently coordinator of NeurOmics, one of RD-Connect's key scientific partner projects.